Barbara B. (Pryor) Wendoloski, 90, of North Providence died Tuesday at the Philip Hulitar Hospice Inpatient Center. 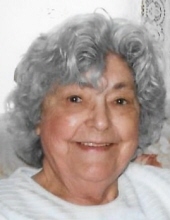 She was the wife of the late William F. Wendoloski, Jr.
Born in Providence, a daughter of the late Leo and Ida (Kloss) Pryor, she had been a North Providence resident for 54 years. Mrs. Wendoloski was a housekeeper at the Our Lady of Providence Seminary for eight years before retiring. She leaves three daughters, Barbara A. Burns of San Antonio, TX; Donna L. LeClerc of Paxton, MA and Debra F. Somers of Conway, SC ; her sons, Ronald Stone of Lincoln, Richard J. Stone of Martinburg, WV; William F. Wendoloski III of North Providence and the late George L. Stone; a sister, Eleanor Olivieri of Johnston; nine grandchildren, nine great grandchildren and two great-great grandchildren. She was the sister of the late Edward Pryor, Leo Pryor and Robert Pryor. Her funeral service will be Saturday at 10 AM in the Frank P. Trainor & Sons Funeral Home, 982 Warwick Avenue, Warwick. Calling Hours Friday 5-8 PM. Burial will be in Highland Memorial Park, Johnston, Rhode Island. To send flowers or a remembrance gift to the family of Barbara B. Wendoloski, please visit our Tribute Store. "Email Address" would like to share the life celebration of Barbara B. Wendoloski. Click on the "link" to go to share a favorite memory or leave a condolence message for the family.